Mix cake according to instructions on box. Generously butter bottom of a 6" or 7" cake pan. Sprinkle brown sugar over bottom of pan. 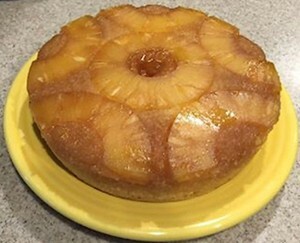 Place pineapple slices in the pan. Pour in enough batter to fill the pan ⅔ full. Place trivet & 1.5 cups water into Instant Pot. Set cake pan on top of trivet. Cook on High for 18 Mins; Natural Pressure Release. Remove cake, uncover & set on cooling rack for 10 mins. * Use a foil sling to make removing cake easier. *Add cherries and/or nuts to bottom of pan if desired. *There will be enough batter to make 2 cakes.